I crushed it this week, hitting my weekly goal by Wednesday. Then I made up for my weak week last week (that was probably more fun to write than it is to read), and hammered out a total of 4000 words. I’m over 40,000 now, and they’re about to leave the general area of the city they started out in. It’s a long journey with some interesting “side quests” and twists, so I’m guessing it’ll be over 100,000 words total. I don’t dare guess how much more than that, but it won’t be a short book, for sure. I don’t want to make any promises, but the map(s) for A Hero’s Birth might be available soon. Harvey is a busy guy, working a day job, creating art, and now teaching himself to play the cello, and I don’t want to rush him, but he got back to me on my e-mail with what I’d like to see, and he said he’s looking at it. There are some changes to the map that appears in A Wizard’s Gambit (Empire’s Foundation Book 2) but I won’t share those publicly, because it contains some pretty huge spoilers from the second book. I want to thank my Patreon sponsors, and everyone who has shared the message that I’m on the crowdfunding platform. At the current funding level, I should be able to get a decent cover for Dawn: A dwarven creation story , in 4-5 months! That’s much better than the “never” I had going for me before. My first e-mail will be going out to my patrons on October 1st, where I’ll be giving a sneak preview of my upcoming short story, Macimanito Môswa. Also, if you sponsor me at any level (even $1), you will see your name in the dedications for that short story when it’s published! As my uncle said, he will continue to support me by purchasing paper back books as fast as I release them, and of course sales are going to be my primary income stream for writing. Patreon is more for people who want a little extra above and beyond. Whatever way you choose to help, even if it’s sharing my books/fundraising campaigns, I appreciate all the support I’ve received! This week I started to settle into my new volunteer role as Genre Fiction Coordinator with Vocamus Press. I met with the chief architect of the group to talk about some ideas moving forward, and I’m setting up my first official informational meeting. That’s not to say there won’t be informal discussion as well, but we have a topic that we’re definitely going to talk about: conventions! I’m pretty excited to talk about them, and gauge interest from the other authors in Guelph. It’d be great if we could set up a table and grow our readerships, while offering a wide variety of books. I also flexed my Genre Fiction Coordinator muscles and talked to the Creative Writing group at the university this week. They had a table out, recruiting people, so I stopped by and gave them my card and a brief rundown of what I’m doing with Vocamus Press. It’d be nice to get some younger writers in there, too. Maybe the more experienced writers will be able to help them along on their journey. If you are in the Guelph area and at all interested in writing genre fiction (or anything, for that matter), feel free to get in touch with me and we can either talk one-on-one, or you can attend one of our meetings. The current plan is to meet once every 2 months, and maybe there will be some extra events if there’s interest. October is going to be jam-packed. On top of Thanksgiving with my wife’s side of the family, I’ve got Book Bash and the official meeting with the genre fiction writers on the 23rd, where I’ll be talking to them about attending conventions. I started a Patreon account. The idea harkens back to ye olden times when artists had patrons who paid them to create. The difference is, today you can have lots of patrons, and each provides a small amount to help an artist thrive. In some cases, there are artists making a living wage (or better) through Patreon. Sure, that’s a rare case, and I don’t plan on getting to that point, but it can be a huge help to fill the world with beauty. Okay, my books are filled with adventure, intrigue, and battle … not sure anyone would call that beautiful, but I like it! I know a lot of people have already contributed to my Indiegogo, and if you have, this isn’t aimed at you. You’ve helped so much already! But if you know someone who’s interested in fantasy and might want to sponsor a writer, please consider sending them my way. My first goal is only $25/month, which will put professional art on the covers of my short stories, as well as allow me to pay for editing. At that amount, I’ll still be covering novellas, novels, and conventions myself, although those are all higher goals. Even $1/month is a big help, and you’ll not only get an e-book per month at that level, but also get your name listed in the Dedication section of all the books I bring out while you sponsor me. Thanks in advance for your help! Missed my writing goal by this much! In case that didn’t come through clearly, I was 850 shy of 3000. But I already started my writing for next week while the rest of the family went out for groceries. There was a conversation that happened between the characters that I wasn’t expecting at all. It was stuff I’ve had in the back of my brain since forever, but figured it’d just be “author knowledge” and not come out on the page. But then this druid was there, and has a totally different perspective on existence than any of my main characters and bam. There it was, pouring out of my finger tips. Love it when that sort of thing happens. I’ve been reading Stephen King’s book On Writing over the last few days, and it’s fascinating. My wife’s aunt got it for me a while ago, and I had put it on the shelf, thinking maybe I’d look at it eventually. Generally speaking, I don’t like the idea of people who have found success telling others what to do. Put ten successful people in a room, and they’ve probably gotten there different ways. You see this sort of thing in the infamous lists that go around now and then with advice from writers who have made it … and they all say different things. So I was pleasantly surprised to read that Stephen King doesn’t believe in a magic bullet. Anyone with any shred of common sense would realize that’s true, because if you could just copy successful people, there would be no unsuccessful people. I enjoyed reading about his past, and was surprised to see him mirror some of my own beliefs about writing. I think he’s a bit harsher on some points, and I disagree that you need to write every day, or that you should read 6 hours per day (ain’t nobody got time for that! ), but some of his points are interesting. He’s made me smile and laugh a few times throughout. His history is full of wild stories, and his ideas of a writer’s toolbox are fascinating. I aspire to become a good writer, even if he doesn’t believe I can ever be a great one (because I wasn’t born with the gift). But I’d be happy with good. And I’ll admit to having more than a little envy when I read that he made $200,000 on the paperback publishing of _Carrie._ I can’t even imagine finding that sort of readership. It’s also impossible to think what I’d do if that sort of money fell into my lap. One thing’s for sure, I’ll listen to King’s cautionary tale, and not fall into drugs and alcohol! I imagine a big chunk of it would go into fixing up the house, or paying off the mortgage. Having an extra mortgage payment worth of money every 2 weeks would be like winning the lottery for the next 30 years. I had a few slow writing nights early in the week, and when I sat down last night I’d only written 1200 words. Instead of writing, I set up the bones of a Patreon page, in case I felt like setting up one. With the thought of getting paid every time I bring something out, I was seriously considering firing it up. However, my timidity struck, and I realized I don’t even like to ask people to buy my books when they’re already out. “Buy my books!” posts are something I hate, and even when I do remind people that I’m a fantasy author, I try to do it in a creative way. Doubling that effort to try to sell books and find patrons sounded awful, so I think I’ll abandon that idea. That took up a night that could have been used for writing. I was a little worried I wouldn’t hit my minimum goal, but then I sat down and the words flowed like a river. 3000 came and went with no trouble at all! It’s hard for me to believe, but I’m up to 12 reviews now for A Noble’s Quest on Amazon. After sitting at 9 for so long, I was beginning to wonder if I’d ever hit 10, and all of a sudden I’ve had 3 in the last couple weeks. Maybe it has to do with the offer to give free advanced copies of A Hero’s Birth to people who review my first two books on Amazon? Maybe it’s serendipity. At 4.1 stars, I’m so happy that people are enjoying the book. I’m going to print off some posters and put them up around campus to advertise that my books are available through the Campus Bookstore. Maybe I’ll find a few more readers that way. I’m applying for a grant. I know it’s a long shot, but winning $2000 or $6000 dollars that goes toward new equipment and travel costs would be amazing! A laptop and smart phone (so I can get a Square and take credit card payments) would definitely be in my future. Maybe a good quality microphone so I could make audio books. I’ve been going through all the conventions I can find in Ontario and figuring out costs of tables, travel, and accommodations. So far I’m up to $4200. I’m still waiting to hear about the table fees for a couple conventions, but even that means I would be short by probably at least $1000. But I hear there are some great cons elsewhere. If you know of any that you think I should attend (I’d prefer to stay in Canada), please let me know! It’d be awesome to take a trip somewhere to promote my writing. To my fellow authors, what would you spend $6000 on if you could get new equipment and travel costs covered? If there’s something I’ve missed that could really help me out, I might rearrange my con schedule to fit it in. Writing went well this week. I wrote 3000 words and finished chapter 4; if I add the work to put together that application, I’m well over the mark. Plus, I drew a very rudimentary map one night to send to Harvey for the new book. A Hero’s Birth will be my first book with two maps: One for the lands we already know, another for the lands across the ocean. I’ll start with the most exciting news of the week! I was interviewed by Steve DeWinter for the upcoming FantasyCon over on Facebook, and we had a great chat. Don’t be scared off by the 40 minute timer, it flew by really quickly with a lot of fun topics. In other news, Book Bash 2015 was great! One of the hardest parts of self-publishing is marketing, so having a local group like Vocamus Press putting on a free event like that is extremely helpful. I sold a copy of A Noble’s Quest and A Wizard’s Gambit shortly after arriving, and I thought, “Even if that’s all I sell, I’m happy!” It was just fun being there and chatting with people. But in total I sold four copies of A Noble’s Quest and three copies of A Wizard’s Gambit. One of the latter was to a former student who just finished reading the first book and wanted the second. That was pretty exciting! The best moment was when Gord Miller, Green candidate for Guelph in the upcoming federal election, stopped at my table and picked up a copy of A Noble’s Quest. I knew he was coming, because I’d stopped by the campaign office with a physical copy of my letter to the editor of the Guelph Tribune. When I was leaving I told two of the people on his team that I was headed to Book Bash and found out Gord was going, too! I joked, “Maybe he’ll buy a copy of my book” and they asked what kind of stuff I wrote. When I said fantasy, I was told Gord was a huge fantasy fan, so he just might! Even still, it was a shock when he showed up and said he wanted a copy. Most people ask questions, or want to hear what it’s about. He just came right over and wanted one. It was pretty surreal. And if you were waiting for my usual Friday post, sorry about the delay. Despite both of us being a little under the weather yesterday, I took my daughter to a Guelph Storm hockey game. Gord got a section of seats for volunteers with the campaign, and my daughter was in a couple of the ads, so I wanted to bring her. She loved seeing herself on the jumbotron, and being a part of helping get Gord elected. She got a green piece of chalk from the campaign office before the game, and was writing “Gord Miller” on the sidewalk on the way to the game. At the game she handed out flyers. I love how much she’s enjoying the whole experience! Well, the Indiegogo is over! I am so happy that editing will be covered by this Indiegogo campaign! That is such a huge weight off my mind, and I’m humbled with the generosity shown throughout the whole thing. It’s exciting that I found new readers through this campaign, and that others returned because they’ve enjoyed what I’ve published so far. Now what I’d like to do is look at the numbers, and discuss statistics for anyone else who’s thinking about running an Indiegogo. Similar to my first campaign, the majority of funds raised came earlier, with the last week being pretty quiet. I learned from the first one that two months is far too long for a campaign, and even a month felt like a bit of a marathon. The interactions on the last few ads were much lower than at the start, and so I slowed down on posting at the end, with a couple days where I didn’t say anything. I was exhausted, and I’m sure everyone else was tired of hearing about it, too. The majority of the funders were known to me, as family and friends. So as you can see from the breakdown, the ability of my campaign to draw in new people who were strangers was extremely limited. Despite coming up with what I thought was a clever idea to beat Google’s algorithms, most of the donations were through my own 1-on-1 interactions with people, and not the ads. So were strangers not finding the campaign at all? I had well over 1000 views from around the world, with most coming out of the USA, the UK, and Ireland. Obviously the ads were drawing people in to at least take a look. I had 2400 Facebook views on one picture, but had no donations from it. That to me really speaks to the difficulty of marketing. 2400 views is pretty huge (for me), and to have nothing come of it was somewhat disheartening. 1-on-1 really is the king when it comes to generating interest. But there’s another possibility, too. I sold more books during my campaign. Maybe people didn’t want to donate, but rather felt more comfortable ordering a book. I can’t be sure, but the funds raised from book sales will go toward the cover art. It’ll just take a couple months for those funds to come in. Setting a low “primary” goal with stretch goals is definitely the way to go. Because I hit $1000, instead of setting the goal at $1800 and missing it, I saved $45. Those fees for not hitting your goal can add up on a big project, so best to set it up in smaller chunks, with your most pressing need being the main goal. The developmental editing needs to happen sooner than the art. I probably won’t be able to cover the art straight away (the A/C unit in our van just died, so we have to prioritize that), but that’s okay because the book isn’t likely to be ready until late 2016 or early 2017, anyway. I’ve got time to save up for that. I still have to pay PayPal fees on the donations. I’m not sure what that will be, but when I send out money requests to people who buy my books, I pay 5%, so I wouldn’t be surprised if it was around there. 2 mugs, 1 A Wizard’s Gambit poster, 3 A Hero’s Birth posters, 1 mousepad, and 4 A Hero’s Birth paperback pre-orders. That will be around $180-200 of the money raised. That leaves me with ~$887 USD (assuming 5% PayPal) + $120 CAD. So I’ll still be chipping in a little bit toward editing. But a little bit is a heckuva lot better than footing the whole bill myself! So again, thank you to everyone who donated and shared the news of my books and the campaign. I couldn’t do this without all of your awesome support. Now that this campaign is over, I’m hoping I’ll have more energy to get back up to 100% writing capacity, and get A Hero’s Birth out as soon as I can! I still can’t believe the campaign has reached 100% funding in three weeks. This blows my mind. That’s a thing of beauty. With all this support, I’ll be ready to do the developmental editing as soon as I’m done writing and revising as much as I can. Every $100 above my goal will unlock a quick sketch from Harvey. I need $800 USD to pay him for the cover art, so that’s eight characters who could be brought to life. And if I somehow go over $1800 raised, well, I’ll just bring out more cards! Once the dust settles at the end of the campaign, I’ll set up a poll for those who will receive physical perks to choose what characters they would like to see cards for. I was supposed to film a segment on Rogers today for Inside Guelph. Unfortunately, I started having severe pain last night. Some ice and Tylenol knocked it down, and I thought I would be better by the next day. That didn’t happen. When I stood up in the morning, the pain immediately started up, and within a few minutes I was in agony. Without wasting any time, I headed to the emergency room, hoping it would be something quick to fix so I could still make it to the filming. But it wasn’t quick. I didn’t get home until half an hour before the time I would have been shooting, and I wasn’t showered, shaved, or even all that alert. I’m rescheduled to do it another time, but it won’t air until after the Indiegogo closes. It’s too bad, because I was really hoping to generate some more interest in the campaign from fellow Guelphites. But, it might still get people thinking about my books that are out, and the information on crowd funding might still be useful to someone else out there who wants to bring out books, or some other product. And hey, it’s awesome that I’ll get to be on TV for the first time ever! If you’d like to help out with the “Not-so-great” problem, please share the campaign with those you know. Fantasy fans are always looking for a new series to sink their teeth into, and with the great reviews I’ve gotten so far, I’m hoping people will be happy with this one! Thanks everyone who has donated to my campaign, and shared the link with others. You guys are helping me out so much, and I hope you love the conclusion to my first trilogy! Well, this week things slowed down, but donations are still coming in! Editing is 50% funded (technically about 60%, with direct donations)! Being a Canadian citizen with the majority of my friends and family living in Canada, I don’t find this terribly surprising that over 75% of the money donated comes from Canadians. With over 3000 confirmed views on my ads, a click through rate of roughly 10% is pretty good. I’m wondering if there’s anything I could do differently to sell all those Americans on my writing. The vast majority of views comes from the US, so I’m wondering if any of my American friends can give me some sage advice on what Americans like. I mean aside from guns, flag-waving, and fast food. 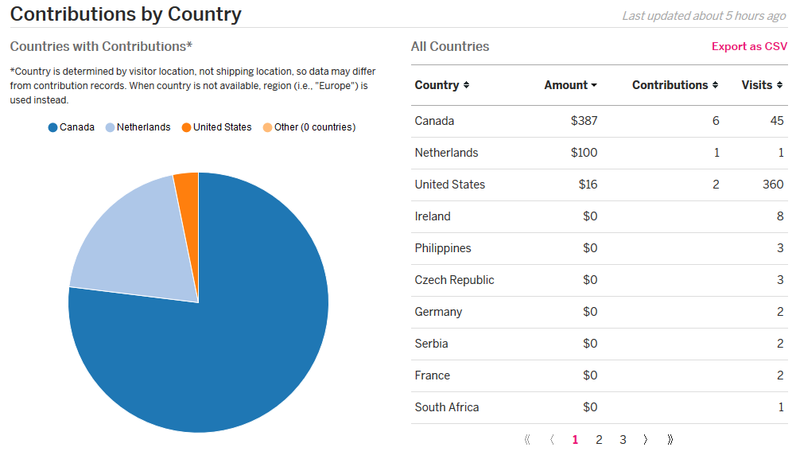 I think I just answered my own question as to why I’m not getting bites from the US. Pssst. There’s an arena battle to the death in book 3… two, actually. Plenty of violence and mayhem. Magical explosions, aerial dragon combat, undead armies, cunning demons, and lots of plot twists. I need more pictures of explosions on the Indiegogo. Yeah… cool guys don’t look at explosions. Thomas would be walking away from a huge fiery burst. Maybe Sarentha wolfing down some magical gruel. And a scantily clad Eliza waving a big old House of Winston flag. With a big gnomish musket. Except I’m not going to sell out. And therein lies my problem with fundraising: my utter inability to go mainstream. But when I say something like, “If you can kick in a buck, that would help a lot!” I mean it! Look at those views. If everyone who has looked at the Indiegogo pitched in $1, that’s 40%. I’d be looking at being 100% funded, and shooting for stretch goal character cards! If advertising worked, and everyone who saw my ads pitched in, I’d run out of characters to make cards for! So don’t underestimate the power of $1 (Plus, unlike most fundraisers, I’m giving you more than just a quick “thanks for donating!” with your $1. You get short stories and a novella!). Of course that’s all very tongue in cheek. I’m well aware I’m not entitled to donations. I’m extremely grateful for everything people have done for my campaign thus far! This is just some idle head scratching. If after all this ridiculousness you’re still interested in donating, here’s the link.